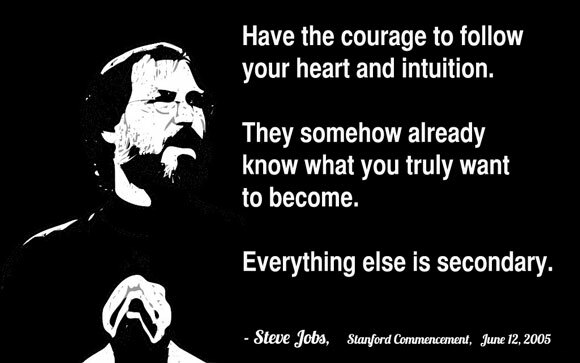 Steve Jobs was an indisputably brilliant innovator and business man. He also had a way with words. When he died in 2012 he left us with a trove of brilliant advice and musings on life. Here are ten inspirational quotes about how to live a happy life that has purpose and meaning. Taking LSD was a profound experience, one of the most important things in my life. LSD shows you that there’s﻿ another side to the coin, and you can’t remember it when it wears off, but you know it. It reinforced my sense of what was important—creating great things instead of making money, putting things back into the stream of history and of human consciousness as much as I could. …getting fired from Apple was the best thing that could have ever happened to me. The heaviness of being successful was replaced by the lightness of being a beginner again, less sure about everything. It freed me to enter one of the most creative periods of my life. Do you know a good Steve Jobs quote? Let us know in the comments!